This 100mm (4") diameter magnifier is ideal for general reading, viewing art and antiques, and scanning large fields of view. A felt-padded lens case is included. 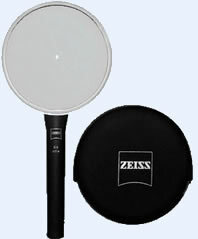 All Zeiss handheld magnifiers feature an aspheric lens shape which eliminates the focusing errors produced by ordinary spherical lenses - so you enjoy the sharpest possible images. Each lens is sized to give you the largest possible view for the chosen refractive power. The Zeiss Multilayer Anti-Reflective Coating is highly recommended to eliminate the distracting glare of sun or room lighting which can bounce off of uncoated glass surfaces and make viewing difficult. Coated lenses are a must for long periods of detail viewing, especially when you must work outdoors or under fluorescent ceiling fixtures or other uncontrollable lighting.